THIS is how we prepped for Maggie’s Ninth birthday party. The family (minus Tor who conveniently napped through it all), got into production mode with Dad at the helm, cutting out the tops, and the rest of us scoop, scoop, scooping for a good hour. 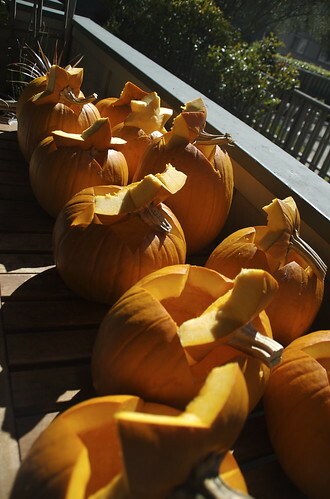 On Sunday we had 11 pumpkins ready for her friends to carve, and all Tomas and I had to do was provide the tools (kits purchased for a couple bucks at our supermarket), some snacks (including home-toasted pumkin seeds) , and a cake. Other than that, the girls completely entertained themselves; something this mama could get used to! This was probably the easiest party we’ve ever thrown, PERFECT for a gaggle of nine and ten year old girls. Sometimes the simplest things can be the most fun, as you’ve shown here. My nephews b-day is the day after Halloween, so my sister always has a Halloween-themed party a few days before. I’m going to tell her about your pumpkin carving party and possibly save her from stressing out too much! Love the ideas on your blog. Hope you don’t mind I posted a link to your blog on mine today. Have a wonderful day! Alison, I’m thrilled you’re enjoying the blog!